Dumbbells are an essential piece of equipment for any home gym. While barbells reign supreme in regards to their capacity to best facilitate large compound movements such as squats, deadlifts, and presses, they unfortunately cannot do it all. And that is where, fortunately, dumbbells come in. While dumbbells can undoubtedly be used for large compound movements, they are best suited to isolation and unilateral strength training. 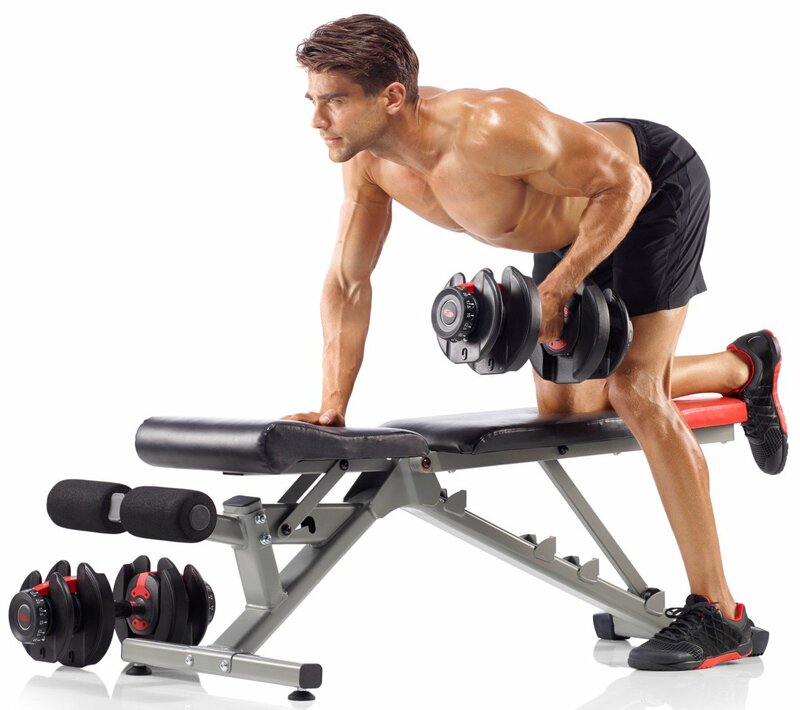 When used in this manner, dumbbells allowing us to target specific areas of weakness, those specific muscle groups lacking in size, or any strength asymmetries we may have. This makes them an extremely versatile, yet effective, piece of equipment that can be used for both upper and lower body movements. With the increasing popularity of the ‘health and fitness’ lifestyle, the home gym scene is booming. In the following article we have outlined the five best dumbbells for your home gym available on the market today, providing you with all the information you need to make an educated decision on equipping your home gym. What To Look ﻿For ﻿﻿In ﻿A Dumbbell Set? 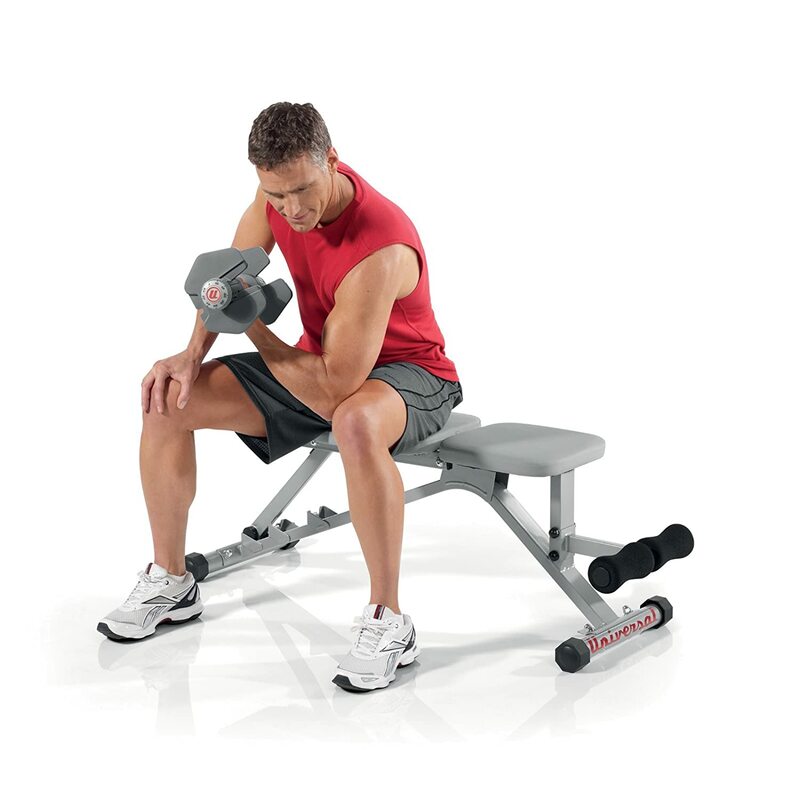 First on the chopping block we have the BowlfexSelectTech 552Adjustable Dumbbells. These dumbbells provide gym goers with an extremely high quality option, at a relatively affordable price point They can be easily adjusted, and as such take up very little room, making them perfect for the home gym. The Unipack Adjustable Dumbbells are the most budget friendly option on this list, providing a good option for those with little money to spare. Opting for the more traditional cast iron construction, these dumbbells come with weight plates that can be added and removed to adjust the weight, using high quality collars to ensure a safe and tight fit. Third up we have the PowerBlock Sport 24 Piece Dumbbell Set. Opting for a more advanced ‘pin adjustment’ method, these dumbbells are extremely space friendly and easy to use. Despite the somewhat new method of weight adjustment, these dumbbells come in at an extremely affordable price, offering quality on a budget. 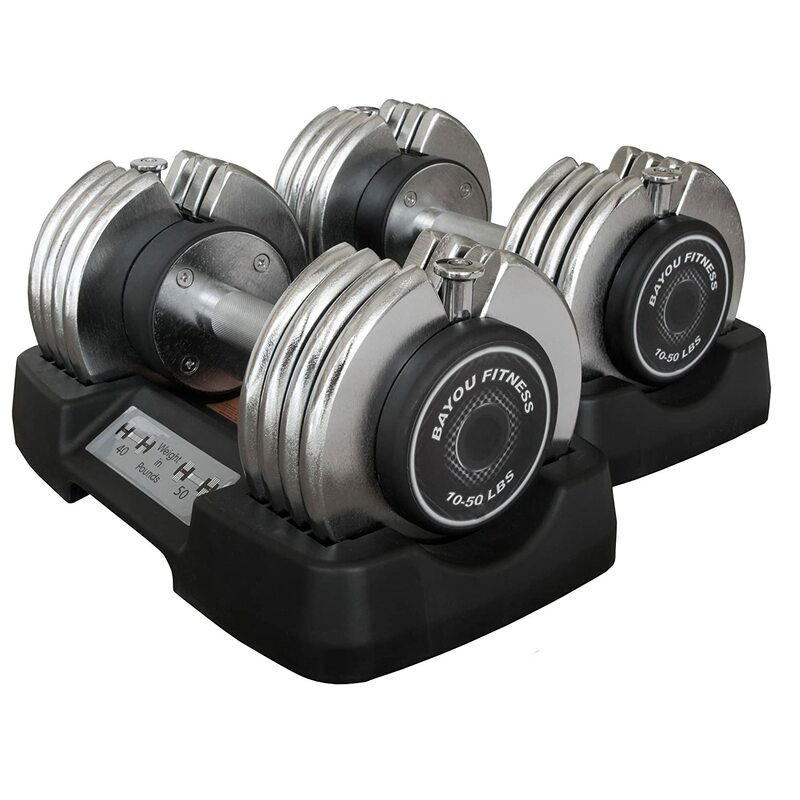 The Universal PowerPak Adjustable Dumbbells use a simple dial adjustment method to alter the load resistance of the dumbbell, making them a great option for your home gym. These are the most expensive dumbbells on the list, offering quality construction and increased durability. These dumbbells also come with an easy to use stand, making them easy to store, and a very space saving option. And last but not least we have the Bayou Fitness Adjustable Dumbbell, a fantastic option that combines durable, heavy chrome plated steel construction with a simple pin method of weight adjustment. These are a fantastic mid-priced option that would be a worthy addition to any home gym. This dumbbell set is a fantastic mid-priced option for those not wanting to pay too much for good quality. This set comes with two individual dumbbells that can be adjusted from 5 to 52.5 pounds, making them acceptable for both compound and isolation movements alike. 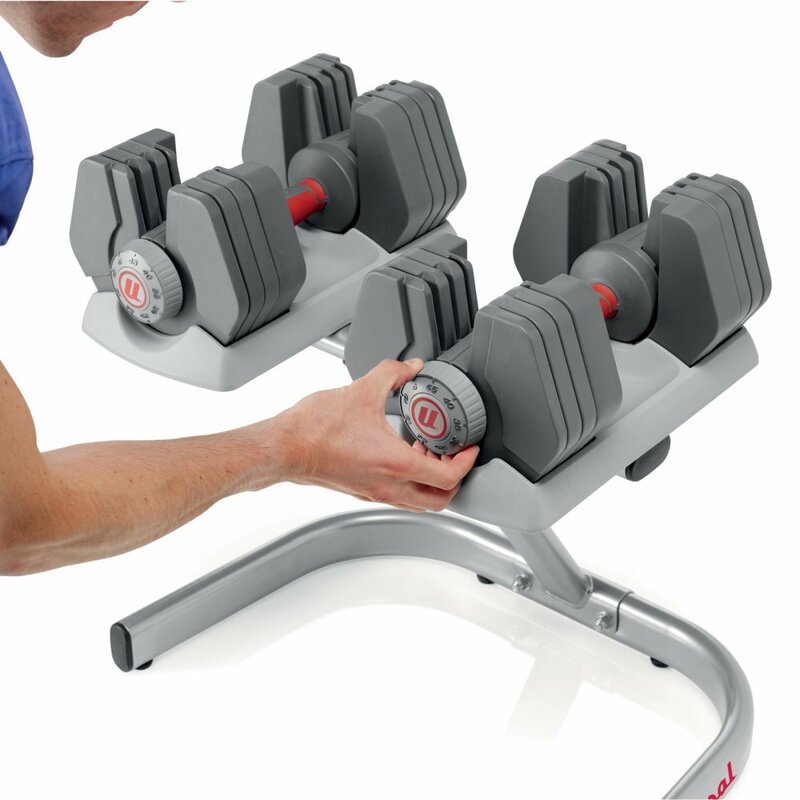 The bowflex dumbbell set uses a unique dial system to adjust each of the dumbbells, creating not only an option that is extremely easy to use, but also extremely space efficient. These dumbbells offer extremely sturdy construction, using quality rubber coated handles to ensure your grip remains strong, further increasing safety. They have been described as both comfortable and durable by a number of users, and as a bonus, this set in particular comes with an exercise book detailing over 30 exercises that can be performed using dumbbells alone, ensuring you get an effective full body workout. One knock on these dumbbells is that as they work on a pre-set dial system, they cannot be loaded above 52 pounds, meaning that they may be a little self-limiting for some more advanced trainees. These adjustable dumbbells by Unipack are the most affordable on the list, offering an affordable and effective option for those who do not want to break the bank. These dumbbells use a traditional method of plate loading to alter the weight, and can be adjusted from 5 to 52.5 pounds. Although this method of weight adjustment is quite simple and effective, it does take up slightly more room than the other dumbbell sets on this list, making it less suitable for those who are extremely safe conscious. In saying that, this method of weight adjustment does allow larger weight plates to be added if they are available, allow us to increase their weight beyond 52.2 pounds, making them an excellent option for those who are interested in more serious strength development. The collars on these dumbbells have been known to slip (something that appears to worsen with age), which does increase the risk of plates slipping off quite significantly. This can be considered quite a safety issue, and is certainly something to be aware of. 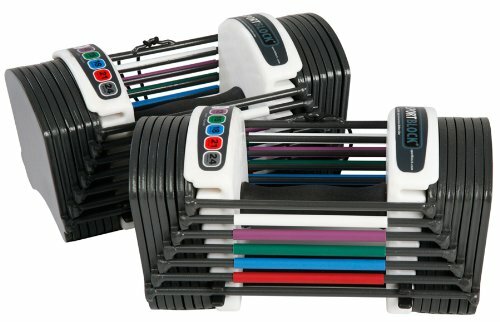 This powerblock dumbbell set uses a unique pin loaded method to adjust the weight of the dumbbells, creating an extremely space efficient option. Although these dumbbells do come in at an affordable price point, they can only be loaded up to 24 pounds, making their use somewhat limited. These dumbbells use very durable construction to provide a very safe and comfortable set of dumbbells – and as a bonus, they also come with a 10 year warranty. They have been described as extremely easy to use, and very sturdy, offering extremely high safety at a very affordable price point. Despite their unique shape, they are renowned for their extremely high level of comfort. These PowerPak dumbbells are the most expensive on our list, but don’t let that deter you. They offer extremely high build quality and a quality dial styled weight adjustment system, allowing you to easily alter the load of the dumbbells. They can be loaded from 5 to 45 pounds, and come with an extremely safe dumbbell stand. This makes them a brilliant option for those with smaller home gym spaces as they are extremely space efficient. These dumbbells offer a high quality rubber handle, increasing safety and making them extremely comfortable to use. They do have quite a unique shape that can take some time to get used to, and as they can only be loaded to 45 pounds, can be a little limiting to more advanced gym goers. These Bayou Dumbbells come with an easy to use pin loading method of weight adjustment, allowing each dumbbell to be loaded between 10 and 50 pounds. They offer extremely high build quality combined with a practical shape to ensure comfort and easy use. They are made from heavy duty, chrome plated steel and as such will last you a very long time. As a bonus they also come with a small rack for easy storage, making them extremely space efficient. 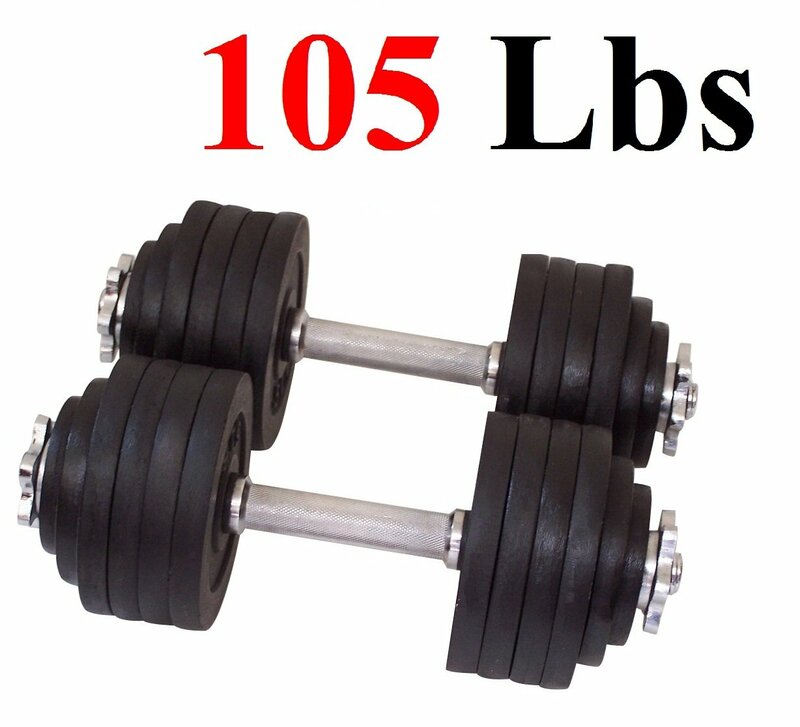 These dumbbells in particular are well known for offering great value for money, providing an extremely durable and safe option for a very affordable price. Use larger weight increments than their competition. What To Look For In A Dumbbell Set? Ultimately, a good set of dumbbells needs to be space efficient, suitable for a home gym of any size, while also offering a vast arrange of adjustable weights. This ensures that they can be used for a multitude of exercises, and by individuals of any training level. Furthermore, they need to be safe for use, comfortable, and of course durable. There is no point in spending good money on a set of dumbbells that only last you a year. 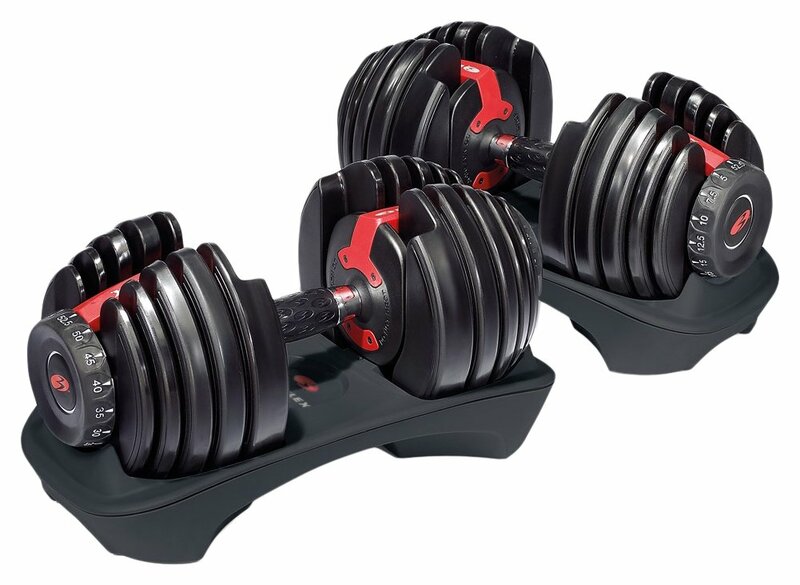 So in conclusion, the only dumbbell set that we feel fits all of those criteria, is the Bowflex adjustable dumbbells. These dumbbells use unique dial method of weight adjustment, allowing simple and safe weight adjustment. Additionally, they can be adjusted incrementally from 5 to 52.5 pounds, making them suitable for a huge number of exercises AND individuals of any training level. Furthermore, they offer extremely high build quality, and come with a bonus exercise book to help you get the most out of your workout. We can say without a doubt that this Bowflex Dumbbell set is the best dumbbells for your home gym by a long shot, and well worth the price investment as they will last you a lifetime.